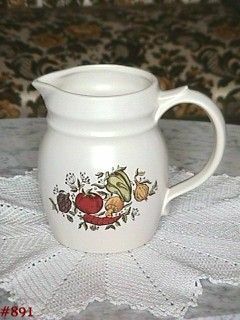 This listing has an exceptional pitcher from McCoy's Spice Delight dinnerware line! It measures 6" tall and is like our item #890 (only this one is larger). Pitcher is marked on bottom: 1272, McCoy, USA, Lancaster Colony (mark). It has a couple small dings, that could be production, on the bottom (underneath) dry ring that are of absolutely no consequence. Pitcher has no cracks, no crazing -- actually appears unused!